Once upon a time, not so very long ago, there lived a merchant in a sparkling city by the sea. His friends called him Mr. Rich, because he had tasted wealth, and he liked it. One day the rulers of the land changed a law. An edict went out that it was forbidden for anyone to purchase alcoholic beverages. Mr. Rich, attuned as he was to trying to get more of the world's goods, saw an opportunity. Not so far away there were two islands called Bimini. They were in another kingdom, which had no laws against drinking liquor. On one of these islands Mr. Rich constructed a club for people from his homeland to visit, for the purpose of imbibing alcohol without breaking the law. All was going well when one day an enormous storm blew up. The tempest dealt a near fatal blow to Mr. Rich's club. But Mr. Rich, because his strong personality convinced him that he would be able to rise above this financial disaster, cast about for a way to overcome events. He consulted with business associates. One of them suggested that Mr. Rich contact an unusual man, a man who could locate treasures in the earth, and look into the minds of men -- both alive and departed. Other wonderous information was also attributed to this man. Why not hire this person to find -- by his mysterious abilities -- one of the pirate treasures spoken of by Bimini residents as being hidden in the islands? Mr. Rich met with the strange one, whose name was Mr. Seer. He offered Mr. Seer ten thousand coins of the realm if he would locate one of the treasures. Now Mr. Seer himself had a desire, although like most all men, he actually had hundreds of different desires because of the many 'I's in his personality. But the amalgamation of Mr. Seer's many desirous 'I's were subordinate to one dominate I, at that time. This 'I' said, "I want to have a hospital, so that I can do good by acting on my strange abilities to diagnose the ills of men." And so the bargain was made, and Mr. Rich and Mr. Seer journeyed with their associates to the Bimini islands to find treasure. "Yes, we have the information as has been given regarding treasure on Bimini Island, with those who made diligent search for same without results. The causes also are apparent as respecting same. Now we find that, not because of the information being incorrect, not because of the lack of diligence in search for same; for the information as has been given is correct, and the search by those seeking same was in order. Then, the trouble lies within that of the one [Mr. Seer] through whom the information is given; for these sources from which the information comes to the material world are from a universal and infinite source, but the channel of same is of the carnal or material plane. Hence we know sin lies at the door, and in that information as has been given respecting same, that the house must be set in order. Now, we find the treasure is there, and it will be located when the individual through whom the information comes sets self in order, in applying self to those principles; for we have, as it were, a criterion, or an example, in the question as asked the Master, "Why could not WE cast this demon out?" The answer was, "Only with fasting and prayer," or coming closer to those infinite binds of the spiritual of the individual to those sources, and in the application of same will then the individual be able to give that necessary; for the treasure remains there as put, and in that place will it be found. Q. How may he put his house in order? A. Through that concentrated effort to make self One with those infinite forces through which infinite information may be given the material-minded individual, in applying same to material conditions. When such is set, through the same sources information will be given, and this will be located; for the information given is correct. Then, "Wait ye on the Lord!" Q. Is there any further information that will help or assist this individual to do this? A. Look into thine own heart and make thine self One with the Universal Forces necessary. These will then answer, for "My Spirit answereth with Thy Spirit, as to whether ye be the sons of God or not," sayeth the Lord. Then make thine paths straight, and walk in that way as is consistent with thine own elements of understanding, and in so doing be helpful to him who falters. And so, Mr. Seer retired from the scene to examine his thoughts and to try to understand the words that he had channeled from above to this material plane. What he didn't know so long ago was that, even today, other men would be examining THEIR thoughts as to why some of Mr. Seer's other predictions or psychic revelations also did not occur. Why, for example, Mr. Seer might think today, was the Hall of Records not found on the Giza Plateau, in 1998? Or why have all of man's many efforts to find unequivocal evidence of Atlantis in Egypt, Yucatan, or Bimini been unsuccessful? We all now know that the reasons "why not" were recorded in Edgar Cayce's reading 996-8, given above. The reading took place on February 7, 1927, at the Halcyon Hotel, in Miami, Florida, U.S.A., not 50 miles across the sea from the land of Bimini. This [resort project] also lends the modes of manufacture -- of electro-hydro power ....by the tides -- such as have been and are being builded in the Bay of Fundy -- for with the walls as may be built in the western coasts of the inlet -- which may be closed or left open , or builded for the purpose of an inland sea for the boat, the port, and for fishing, bathing, and the like -- this may be builded in such a manner on the northern shore of the south, and the southern shore of the north island, as to facilitate the power sufficient to electrify the whole of the lands that may be acclaimed and reclaimed. Q What minerals will be found here? Q How deep in the ground will that be found? A In the wall that would be builded from the western portion of the south island towards that of the PROMINENT portions of the southern portion of [the northern?] isle -- these will be found in the twelve to fifteen (12 to 15) foot levels. The VEIN, as workable, would be found extending in the northeast southwest direction. Q Give the exact longitude and latitude of the vein? A In this we have the island -- in this we have the place. Find these, or locate. These are known. The only unclear portion in the above material seems to be the location of "the PROMINENT portions of the southern portion of isle." However, as may be concluded from the scientific study reviewed below, the only wall that could be built that would be sufficient for electrical power generation by means of Fundy-like, tidal-power generators would be a wall that extends across the inlet. Thus, the reading must be referring to the prominent portion of the southern portion of the north island. Any wall that would be built might well have its western end tied into the relatively high ("prominent") ground at the south tip of North Bimini. This prominent elevation is more or less coincident with the southern end of the long hotel of the hotel-and-pool complex shown slightly above the center of the color airphoto. Note my concept of the approximate trend of such a wall in the figure below. The figure is from p. 76 of my 1968 booklet, "Earth Changes, Past -- Present -- Future" (Anonymous, 1968, A.R.E. Press, Virginia Beach, VA., 23454). If built with a lock for allowing boats to transit to and from the lagoon, and with several in-wall hydroelectric generators, it might be possible to realize the resort- complex dreams of the reading. Inlet currents and surficial geology. 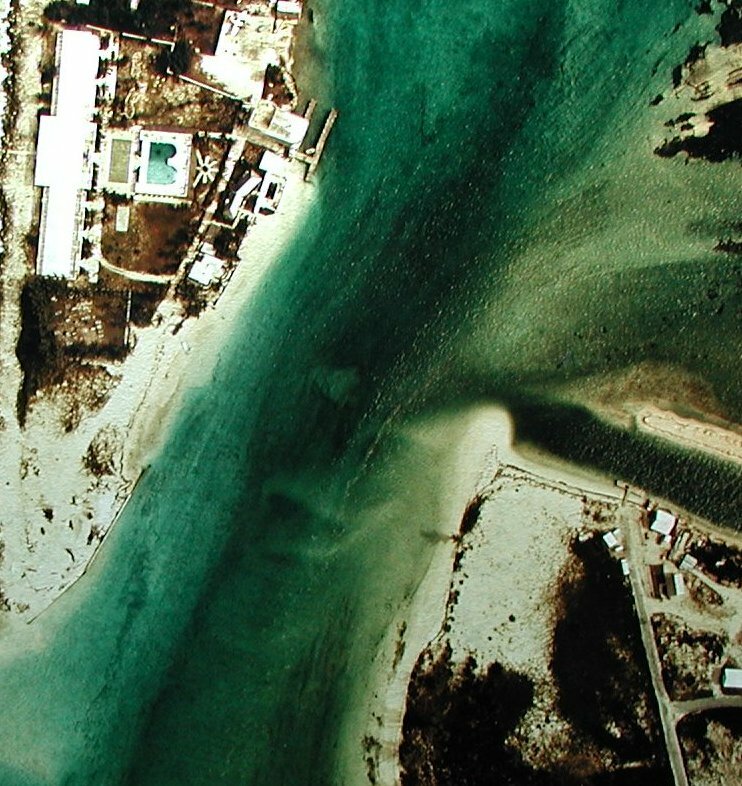 In a "Field Study Of A Tidal Inlet, Bimini, Bahamas," published in the Proc. Twelfth Coastal Engineering Conference, Sept., 1970, scientists report measuring the velocity of tidal currents in the inlet. Their results showed that south-flowing ebb currents were stronger (av. 1.7 kts) than north-flowing flood-tidal currents (av. 1.4 kts.). The scientists also presented a generalized map of the inlet bathymetry and surface geology (see figure). Whether the inlet flow velocities and water volumes are substantial enough to generate electricity "sufficient to electrify the islands" requires an engineering analysis that is beyond the scope of this article. Nature's Gold Factory. 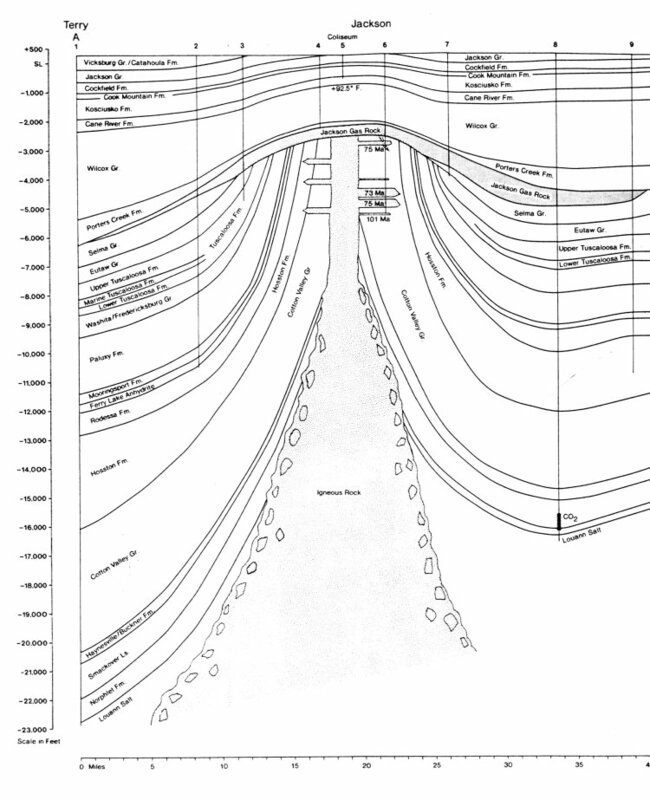 In a paper published under this title (Science, 1999, v. 284), Robert Kerrich provides a schematic section of Earth's crust that illustrates channeling of hot fluids into shear zone faults. For you chemists, it is in such faults that AuHS(H2S)30 destabilizes to precipitate metallic gold at 400° to 300°C and reduced pressure. Only about five per cent of the world's gold is from lower or higher temperature deposits. 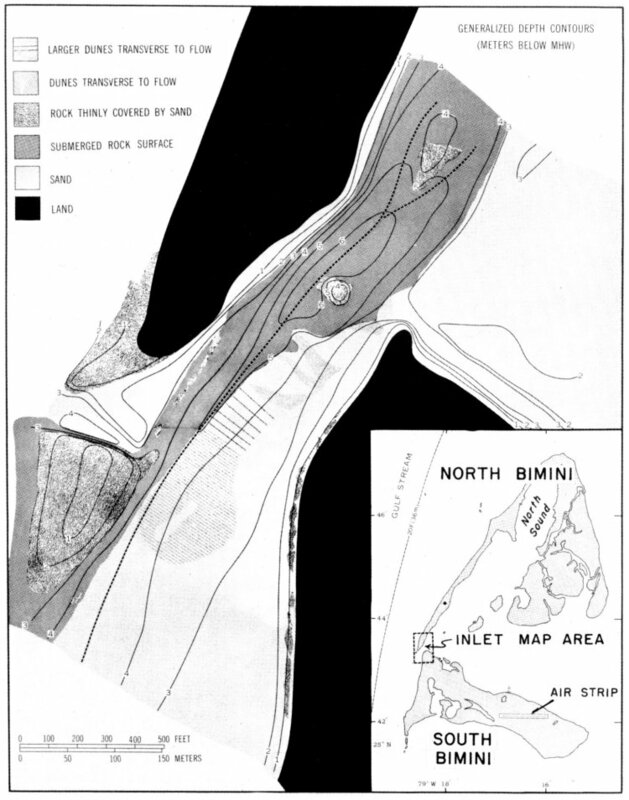 Presumably the gold vein at Bimini, if it exists, is a lower-temperature deposit. The sulfur (S) in the formula is interesting, because reading 996-12 also mentions that black sulfur water may be found on the north island. Just what minerals are being spoken of here? One cannot make any sense of "icthyolite" minerals (plural). Most probably, the stenographer, Gladys Davis, was unfamiliar with the word she heard during the reading and therefore appended the question mark that appears in the official transcript. Thus, we may presume that "ijolite" minerals were meant. Ijolite is, technically speaking, the phaneritic plutonic counterpart of olivine-poor nephelinite, and ijolites rocks are characterized by a long list of accessory minerals such as apatite, sphene, calcite, melanite, phlogopite, sodalite, perovskite, wallastonite, cancrinite, pectolite, and zeolites, any of which may increase sufficiently in amount to become a major constituent. Some of these minerals are "spar" minerals. So what would be the source of such minerals in an otherwise thick carbonate sediment environment? Only a volcano, or possibly a major fracture zone, that taps into the volcanic rocks buried beneath the Bimini Islands. Reading 996-12 refers to the Bimini Islands as "these mountain tops." This makes one think of a twin-peaked volcano. Geoscientists think that the Bahama Banks were built by coral reefs on a spreading ocean crust with volcanic extrusions. This occurred when the African plate split off from Florida during the opening of the Atlantic, in the Jurassic Period some 150 to 180 million years ago. An extrusion could have produced a twin-peaked volcanic mountain that became surrounded and then covered by coral reefs as the bank slowly subsided over geologic time. If a twin-peaked volcano underlies North and South Bimini, it is probably buried deeply. But the morphology of that volcano could be preserved somewhat in the overlying carbonate rocks. Volcanic landforms typically undergo considerable erosion prior to their entombment by reef limestones in areas of slowly subsiding crust like the Bahamas. Sometimes only the lava spines of the original volcanoes remain. I conjectured in Coming Earth Changes (Hutton, W., 1996, A.R.E. Press, p. 179), that the "vein minerals" of the Cayce reading would be found in a fracture in the carbonate country rock that resulted from an episode of injection of fluids from the volcano below. This gets us back to our considerations about ijolite rocks. Idealized spatial relationships for a hypothetical carbonatite-nephelinite association as encountered in eastern Africa. Intrusion of ijolite magma produces fenitization of wall rocks and erupting magma builds a volcanic cone of nephlinite, which then undergoes a caldera collapse. C3 = late-stage carbonatite dikes. The above figure shows that certain carbonatite-nephelinite/ijolite associations comprise conical composite volcanoes that are typically circular or elliptical in outline, and the constituent rock units form plugs, arcuate ring dikes, and cone sheets. An example of such a volcano is Oldoinyo Lengai in Tanzania. If, and there is no doubt that this is a very big if, there is a buried carbonatite volcano at some depth beneath Bimini, one might further speculate that the “vein of gold, spar, and ijolite” could be part of the ijolite and related magma materials of a volcano center core. Finally, certain trace elements in carbonatite assemblages, like yttrium, zirconium, niobium, molybdenum, lanthanum, and cerium are attractive for their economic value. Gold minerals are few in number, if it is minerals that 996-12 is referring to. Calaverite, is a gold telluride consisting of AuTe2, with small amounts of silver. Although this is a rare mineral, in Australia and Colorado it is an important source of gold. Note that the Bahamas fracture zone runs just north of Bimini, trending NW by SE. The linear ridge feature mentioned above, therefore, could underly the Bimini Islands. But let's begin to move from hypotheticals to known facts, by asking whether there any analogues in the southeastern states to our postulated Bimini volcano? Buried Volcanoes in Mississippi. A couple of buried volcanoes have been found in Mississippi. We'll use the volcano that has been discovered to lie only 2900 feet beneath the Mississippi state capital as the analog for our speculations about a twin-peaked volcano lying beneath Bimini. In 1997, three Mississippi geologists published a report entitled, "The Jackson Volcano" (Dockery, D.T. and Others, Mississippi Geology, v. 18, no. 3). They indicate that the Jackson Volcano's dense core forms a prominent anomaly on gravity and magnetic surveys of the state. The igneous rocks of the core and the uplifted formations around it, comprise a geologic structure called the Jackson Dome. Northwest of the Jackson Volcano is the buried Midnight Volcano and the associated volcanic terrain of the Sharkey Platform. All of these features are part of the rim of fire that existed in the northern Gulf during the Cretaceous Period between 144 and 65 million years ago. The Jackson Volcano's igneous rocks are dated at about 69 to 79 million years in age. 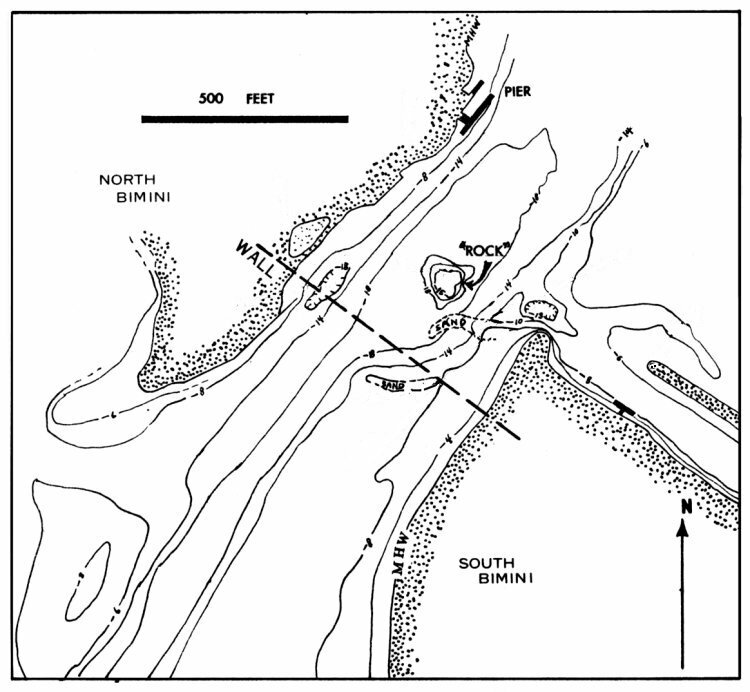 Volcanism in the north-central Gulf occurred in a vast seaway occupying the Mississippi Embayment. Volcanoes rose above the ocean surface and formed volcanic terranes from southern Arkansas to southernmost Louisiana. Igneous rocks exposed in southern Arkansas include the Murfreesboro lamprophyre and the Magnet Cove carbonatite complex, which complex contains an exotic array of rare minerals. A similar complex may underlie the Jackson Dome, shown in the figure below. The center of the core of the buried volcano lies directly below the Mississippi Coliseum. "is no reason to believe that any of them will ever erupt again. However, there is no more reason to believe they will not. Today the Gulf Coastal Plain is a quiet, passive, continental margin, with the exception of the New Madrid Seismic Zone. This is one reason geologists suspect that buried Cretaceous volcanoes within the province have vented themselves for the last time. However, igneous provinces are known to have rested for almost 100 million years before returning to life.....Also, the Jackson Dome has risen in respect to its surroundings ....less than 30 million years ago" (Dockery, and Others). Such findings suggest reactivation possibilities for our hypothetical Bimini volcano, although we have to require the reactivation to have occurred in the recent geological past in order for gold-bearing fluids to penetrate the late-Pleistocene rocks that underlie Bimini. Such reactivation could be related to the postulated sinking of Atlantis, beginning 20,000 years ago. If a volcano lies beneath Bimini, it should be relatively easy to detect by gravity and magnetic surveys; that is, "if the geological survey would be made in some of these [Bahamian Islands] -- especially, or notably, in Bimini ...." (364-3, 2/16/32). If a vein of gold and spar is present near the surface in the area of the Bimini Inlet, it should be detectable by the geophysical survey methods described below. The following portion of reading 996-11 may be of value to those who decide to search for the vein of gold and spar at Bimini. The reading was conducted at Miami's Halcyon Hotel on February 28, 1927. Mrs. Cayce conducted the reading, and Gladys Davis was stenographer. Three of the men who were partners in the search for treasure were also present. This reading was a gut-wrenching reappraisal of the entire treasure-seeking operation, with special attention devoted to what Cayce should do next. (Q) What conditions should be set aright before Edgar Cayce leaves Miami for Virginia Beach? And should he leave before treasures are obtained by those seeking same? (A) It has been given that conditions should be set aright, and conditions have been set aright, in that those who seek may - applying in the way and manner given - obtain the treasure, and many more treasures that build the inner man - and with these then set in that manner, necessary that those continuations of the forces set in motion by the body be carried in that way and manner. The time has been given when the body physically should return. The body mentally may remain with those seeking, would those seeking desire same, see? (Q) Explain what is meant by body remaining mentally? (A) That the information given for the directions may remain with those seeking, see? For Mind is the Builder, and in the building is how each applies in the action that as is gained - for, as we find, every thought is as a deed, and - as given - may be made a miracle or a crime. In the multiplication of words, and in the application of same, man builds in character and in the manifestations of that which man worships - and the worshipful mind is the builder. In leaving mental, then, is that the desire of each be to so apply self in mind and in action as to meet, merit, carry forward, that as would give the WORLD - MANKIND - the friend, the neighbor - the companion - the reflection of the individual's concept of that truth as manifested. See? [A pause - during which one or two individuals started to present a question. Evidently, this is the answer to one.] Sure - see? Then, as this: From the heart the mouth speaketh. In the application of ideas created in a mind by words from others, the actions of individuals are carried forward. In leaving the mental body (that is desired by those seeking) is: Those who seek in accord with that given may have that as is outlined may be obtained. Others will not, see? (Q) Should these start in the morning to seek for these treasures? (A) When ready, start. Keep at it until obtained, see? All in one accord. Not as just to obtain a treasure, that it may be spent in gaining affluence, or in gaining the lordship over others, but that same may be applied in the way and manner as is given in how each should apply self in MANIFESTING self in the correct way and manner, see? Start to-morrow - start to-day! It will be found between now (on this day - last day of February, yes) and the fifteenth (15th) of March. (Q) Who will find same? (A) He that seeks in the correct way and manner. (Q) In the reading given on February 24, was it meant that Edgar Cayce should return to Virginia Beach within eight days from that date? (A) Within eight days from that date. (Q) Should leave Miami within eight days or be in Virginia Beach within eight days? (A) Leave Miami within eight days - for, as has been given, and as is given here again in this manner, when the truths as are set (from the Universal Forces, which are of the Creative Energy) before those who would act as respecting same, THEN the opportunity, the time, the work, is set aright and in order. Just as has been given as respecting operations that were hindered, and as the setting aright of same. All in accord - for, as has been given, THEY succeeded, for ALL were of ONE mind, and in accord one with another [Acts 2:1? ]; for, as may be illustrated, as is seen in this: The body physically is made up of many atomic units, yet when one is not in accord with another trouble ensues, and when murmurings or dissensions arise from within, disease - and finally DISEASE - sets in. When a body of individuals (with the mind the builder again) sets forth to gain from that same Universal Energy, or Forces that build, and in the physical, the material, the mental, the spiritual plane, are in accord in mind and in action, the WORLD may be TURNED AROUND, see? For, as it has been given, faith may remove the mountain, see? Q) Are those seeking the treasure in accord one with another? (A) Not wholly. We would be aright, and in accord. Each must set own house in order, and let each bring one to another that of the purpose, remembering: When fault is found, more than the greater percent is found in self. (Q) Which ones are not in accord with the others? (A) All are not in accord with the others! Each one not in accord with the other, and all should be in accord, if we would have the more perfect cooperation, the divine success, as necessary. Not that the action of either in this manner may change the place or location, but changes actions as to the finding, and as to the ultimate result, see? Take lessons from those of old. Consider the chosen, as they left for the land of Promise. When murmurings arose, and disorder distrust - seeking after vain glories, vain conceptions, desires of the flesh, pride of the eye, lusts of the heart - these brought many wanderings. Consider when the prophet called down to Carmel, and the fire consumed the sacrifice, and yet when murmurings arose the distraughtness was such that even the CHOSEN fled into the mountains, and it was found not in the storm, the earthquake, nor the winds - but in the still small voice from within, that brought power, and the abilities to apply same. In the minds, now, of each has been placed a trust, a concept of the divine manifestations of truth in the physical and mental world. Each now, applying same, work out that as is necessary to bring into being that which will redound to the glory first of the Giver of all good and perfect gifts, and in the applying of that GAINED through same bring to self and to thy neighbor the better conception of the purposes in life.